Flotsam and jetsam float about in Captain Jim’s Molten Orange Ambrosia hot sauce. This slightly chunky yet thin hot sauce really brings the heat. Appropriately named “Molten” – this sauce is a hot one! Along with our friend and fellow chilehead, Michael Pedersen, we’re searching for a pineapple/habanero replacement for the defunct Dragonfire Hot Sauce. Will Molten Orange be the one? Ingredients: habanero peppers, water, honey, distilled vinegar, pineapple juice, mustard seed, orange juice concentrate, cilantro, salt, ground black pepper, turmeric, paprika, spices, natural flavors. 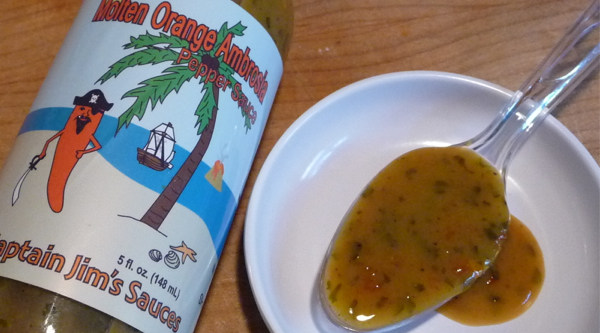 Captain Jim’s Molten Orange Ambrosia Pepper Sauce is their hot version of their original Sweet Orange sauce that is sadly no longer offered, due to slow sales. I’m hoping they re-think this path, and either bring back the original Sweet Orange, or create something in between. This Molten Orange is too hot for me to use on a daily basis. 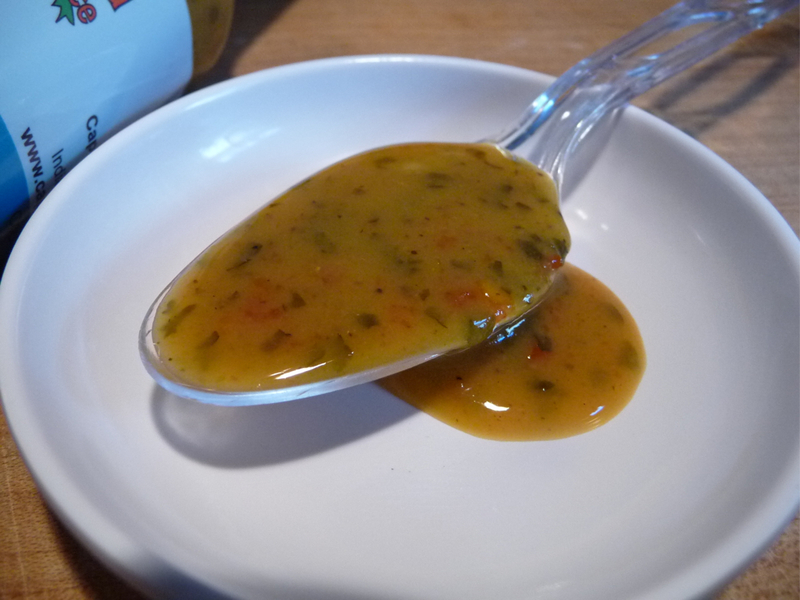 Nice looking sauce – I could do without the pepper seeds. Texture & Appearance: – I smell fresh habanero peppers, and orange and vinegar and some onion, with a strong herby scent. It has an interesting color of a dark honey mustard with lots of green bits. This thin sauce is quite pulpy – and this is a plus. There are bits and pieces of fruit, peppers and spices that are very satisfying. But there are also some pepper seeds that are not chewable, and I’d like to see them strained out. They add nothing to the flavor, and only add an annoyance to the texture. Taste Straight Up: – The flavor is huge, and hits you straight up with tons of sweetness – honey along with the citrus juices are big players at first. That is quickly followed by a searing heat. The burn is on my lips and in my throat. And it lasts. Even though there is a nice sweet flavor right away, the heat overpowers that, and so this sauce becomes another “too hot for me” variety that is not flavorful enough. Heat Level: – Big. Hot. Searing. The in your face heat trumps the wonderful flavor in this sauce. Once again, I have to ask Captain Jim’s to back off on the heat, and bring back a version that combines the fresh heat of this sauce, with the flavor of their original Sweet Orange sauce. Overall Rating (Taste on Food, Final Thoughts): – I poured some of this sauce on some tacos recently, and I have to tell you the bulk of the food did temper the heat just a bit. So, compared to tasting this straight up – when spooned onto tacos, it was a much better experience. Still, the searing heat came through. 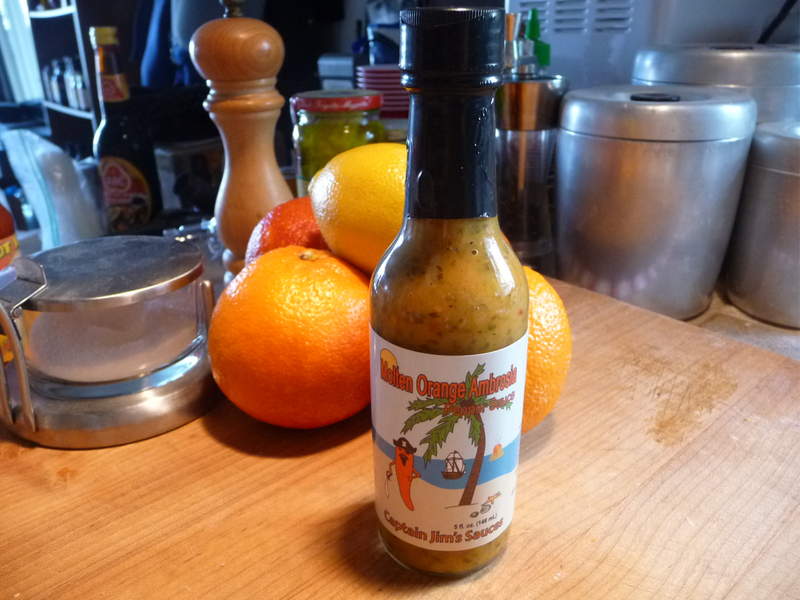 Bottom line: I personally don’t think this could be an everyday orange/pineapple habanero sauce. It just has too much heat for a “table sauce”. But you may love this stuff, as the flavor is big and bold, and the heat is definitely abundant. Brian, we hope to continue making Sweet Orange Oblivion, but it will be a seasonal product, made in small batches. When it’s gone it’s gone till next year. Thanks a bunch for reviewing our product!! That’s really good to know, Jim. Thank you for telling us that Oblivion will live again! I’m a hot sauce wimp. I like habanero sauces like Orange Crush but that’s about my limit. Sounds like this one is a bit above my heat tolerance.